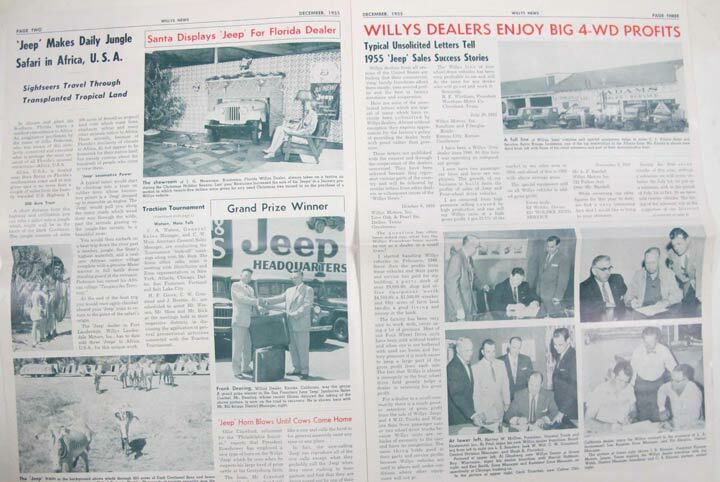 Wally Cohn — Jeep King? 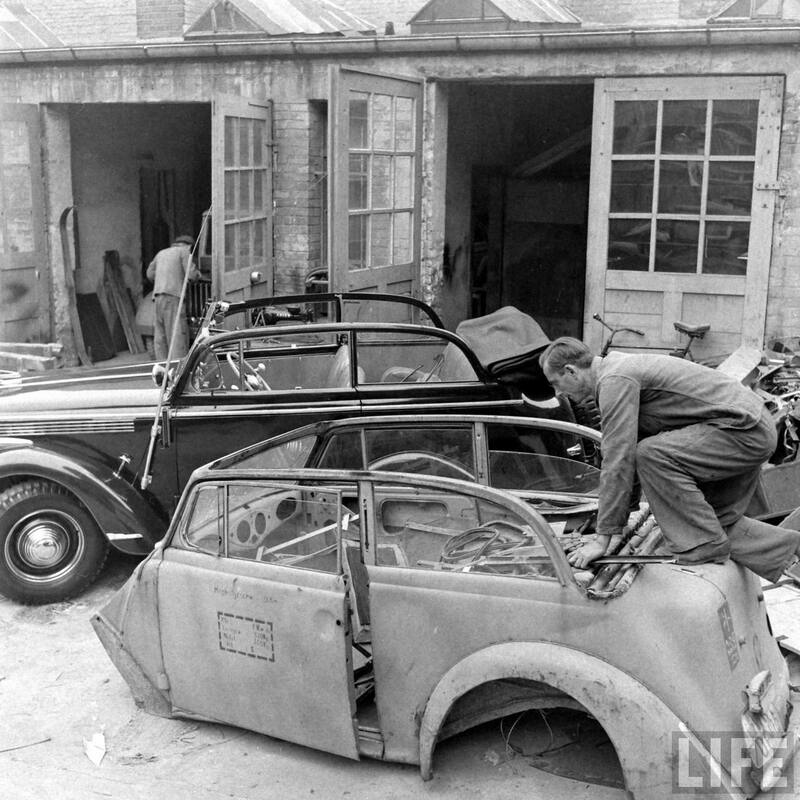 March 6, 2019 • CATEGORIES: Features, Magazine, Old Images, Other 4x4s, Sedan-jeep, Unusual • TAGS: Life-Magazine, Odd Body, Walter Cohn. UPDATE 3: I’m taking Wednesday (03/06/2019) off of posts to write an article, so here’s an oldie, but a goodie. 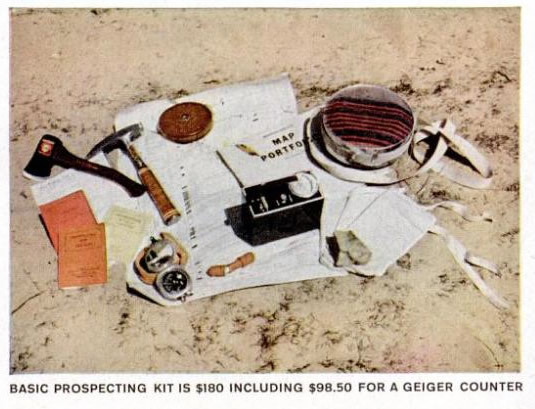 UPDATE 2: Daniel Strohl over at Hemmings provided a solid background update about Wally Cohn. 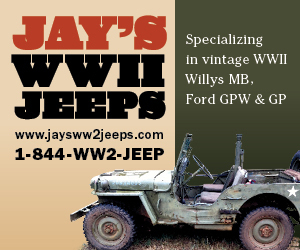 UPDATE: A reader named Clint just determined what type of vehicle Wally was using — A 1936-1940 Opel Olympia. 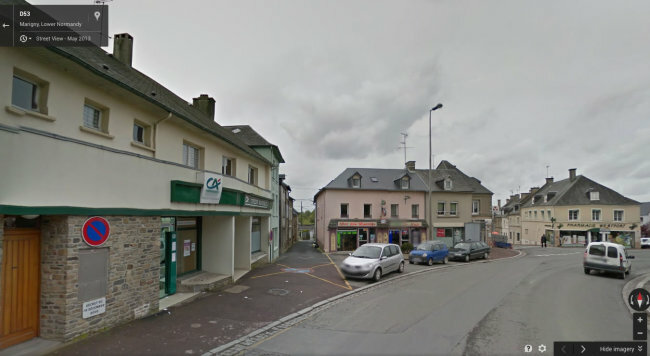 Here are two links to images: Link 1 & Link 2. Thanks Clint! 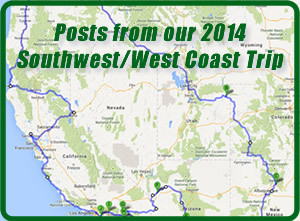 ORIGINAL POST published in 2010: I ran across the images shown below and others. I didn’t think much of them until I looked more closely. 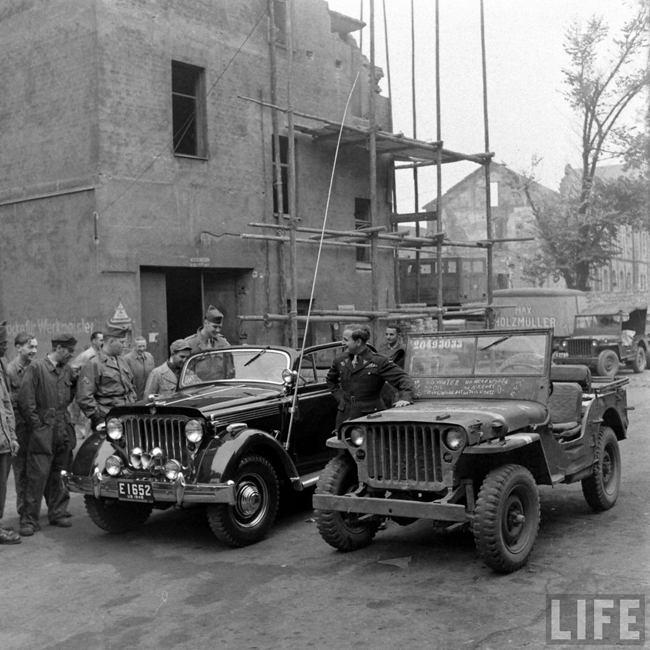 It appears the builder, who I assume is Wally Cohn, has merged a 1936-1940 Opel Olympia with a MB to create, arguably, the first Jeepster-like vehicle, except it is four wheel drive. 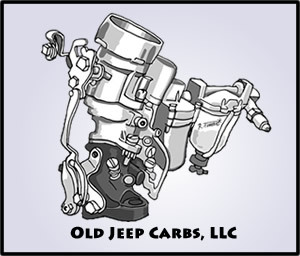 The ‘Wally’ appears to use the entire jeep drive train. If you look in back, you’ll even see this car can tow a trailer! Who is Wally Cohn? I have no idea. 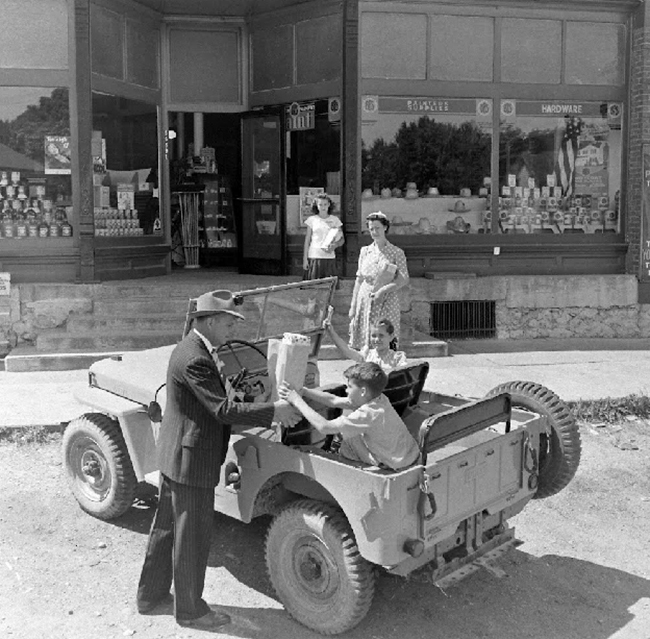 I can’t seem to find anything about him, other than his name was Wally Cohn and he was nicknamed the Jeep King by photographer Walter Sanders. 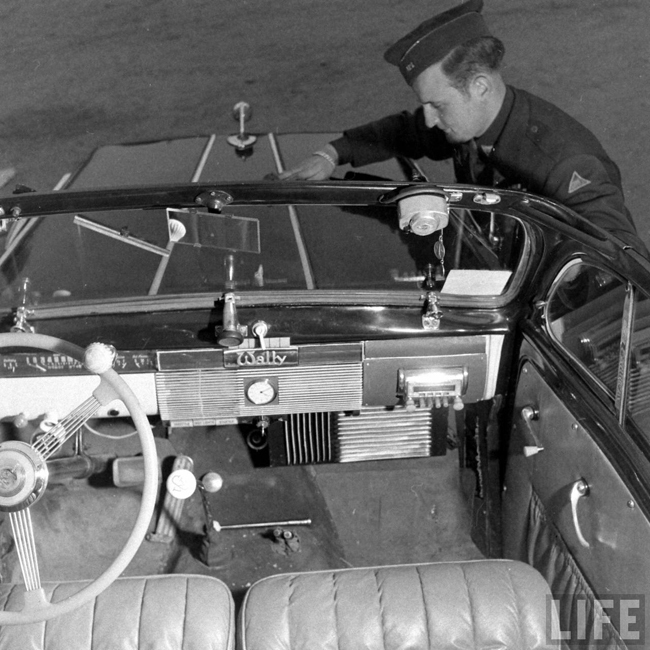 Photographer Walter (Wally) Sanders worked for Life Magazine from 1944 to 1961. After growing up and leaving Germany for the US in 1937, he returned in early 1946 and lived the rest of his life in Europe, mostly in Munich. 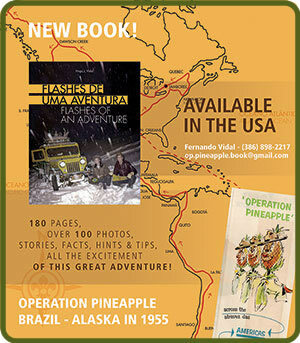 You can learn more about his biography here. 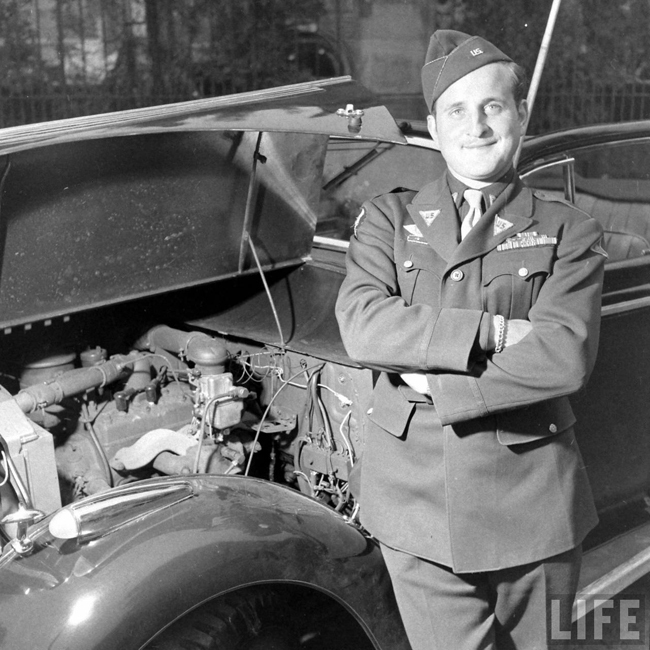 Because Walter was in Europe during December of 1946, and because these photos were snapped during that month, and because of Wally’s uniform (which Bob noted is an Army Airforce Uniform), I have concluded that Wally Cohn was a member of the armed services trying to merge cars and jeeps into a Wally vehicle of some kind (note the name Wally is displayed prominently on the dash in one of the pics). 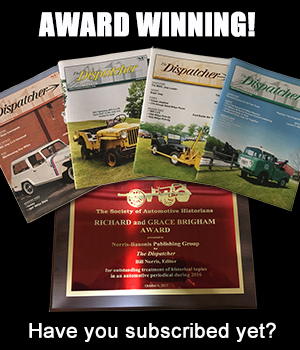 This would be a great collector’s item — and a cool jeep too! 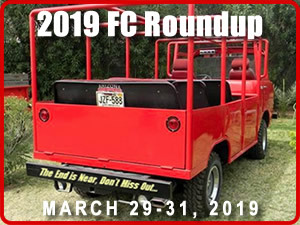 February 10, 2019 • CATEGORIES: Features • TAGS: jeep-name, Life-Magazine. This summer of 1942 article highlights some of the confusion surrounding the jeep name and might be one of the first documented instances of someone claiming that GP became jeep. As I’ve argued, I see no reason to believe that’s the case. 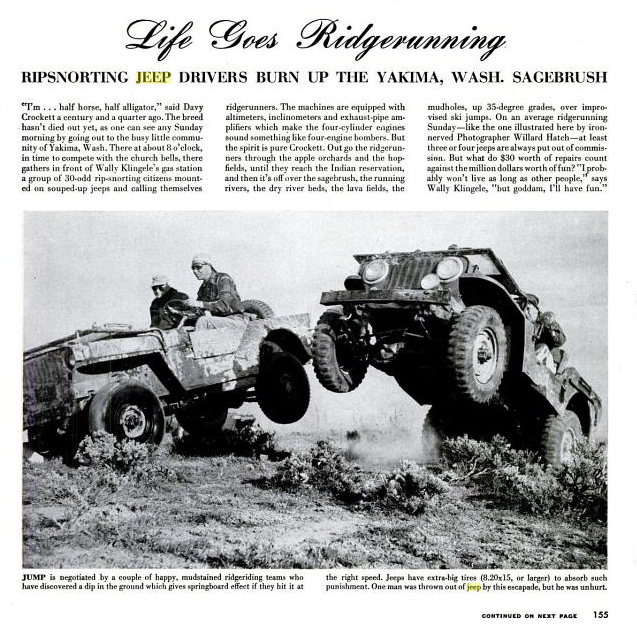 February 7, 2019 • CATEGORIES: Bantam-FordGP-WillysMA-EarlyJPs, Features, Magazine, Old Images Jeeping • TAGS: Life-Magazine. 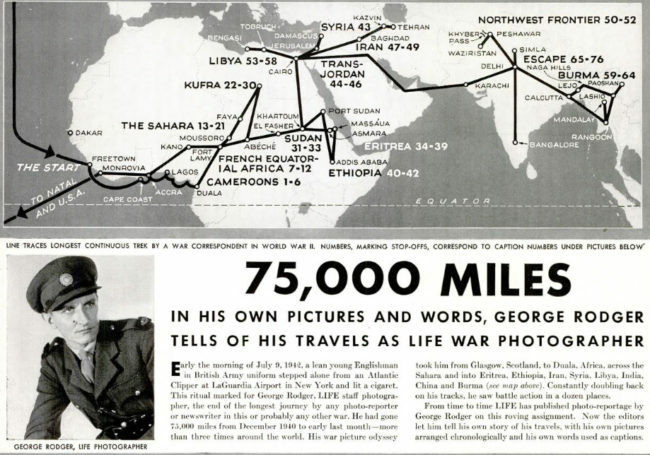 During a 75,000 mile adventure between 1940 and 1942 Life photographer George Rodger photographed the growing war across Africa, Europe, and Asia. 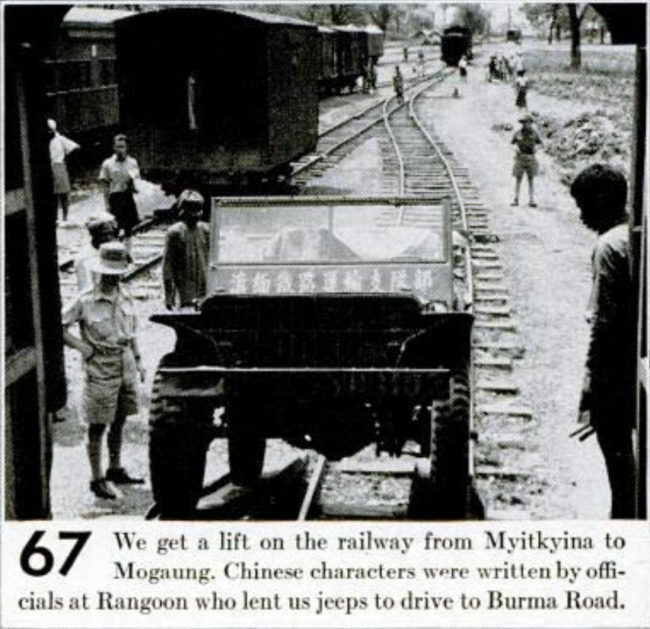 During the latter part of his adventures he found himself using, then abandoning, Two Ford GPs sent to the Chinese as he and his fellow adventurers escaped Burma. 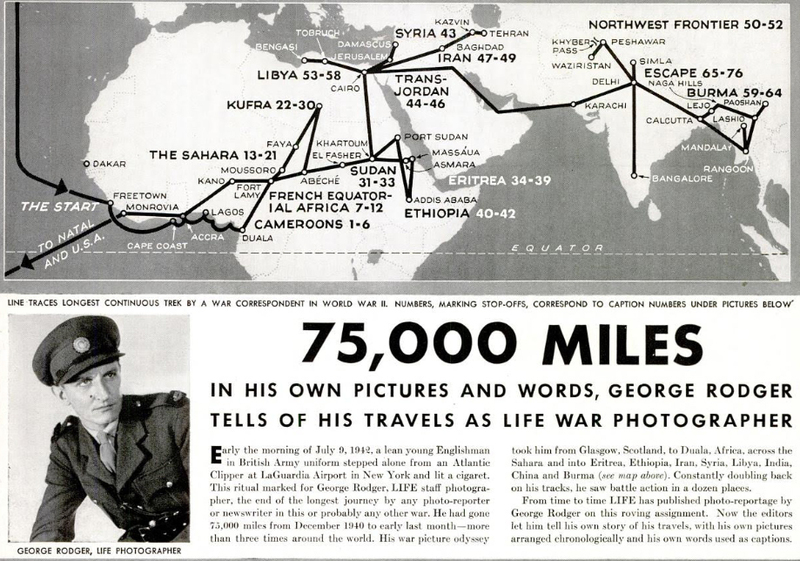 He reported on these adventures, through photos, in the August 10, 1942, issue of Life Magazine. 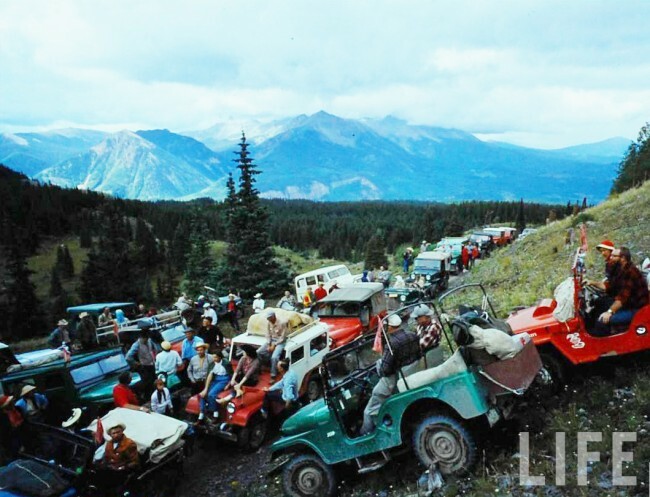 October 18, 2018 • CATEGORIES: Features, Magazine, Old Images Jeeping • TAGS: Life-Magazine. Photo from the Denver Post. 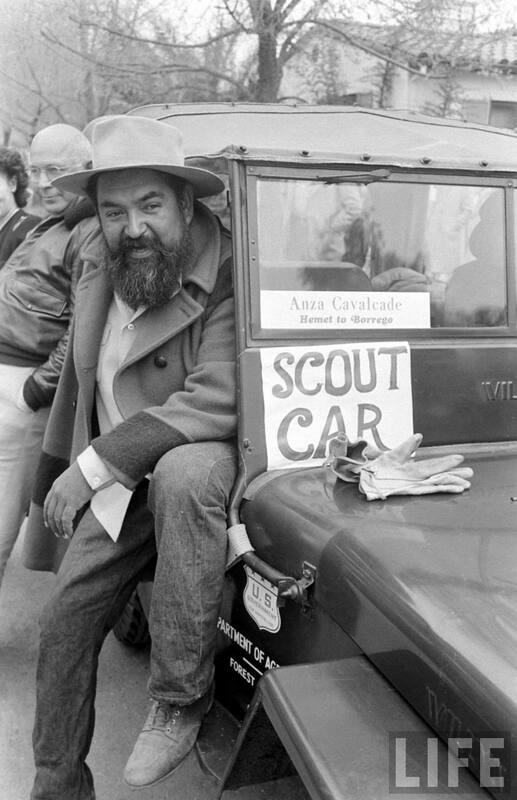 Both Life Magazine and the Denver Post covered the event. 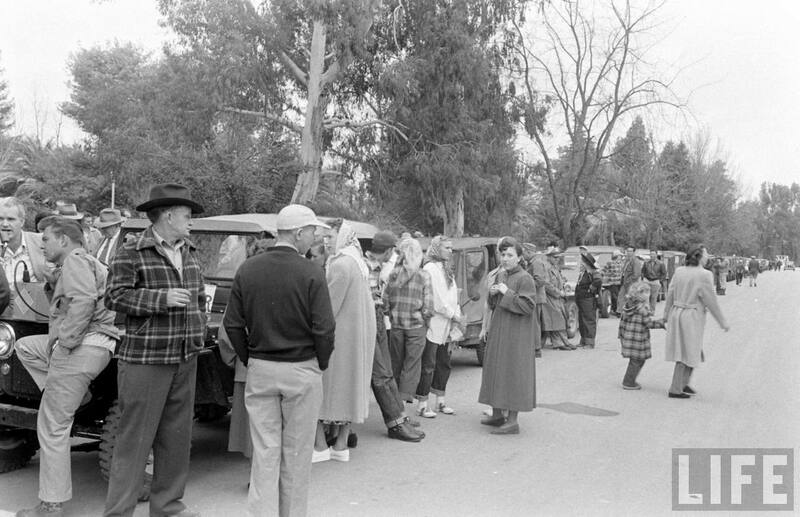 Note the white wagon above. It appears in a couple of the color photos below. UPDATE: These Life Magazine photos and some other information was originally posted in 2011. 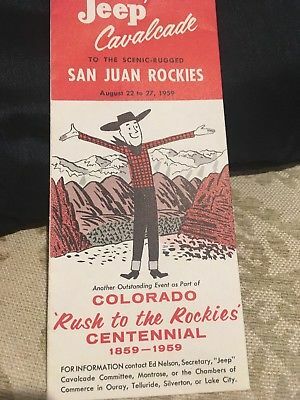 A couple days ago I confirmed that these photos were from a special 1959 Jeep Calvacade, organized as one of many events during the 1859-1959 Rush to the Rockies Centennial Celebration. I’d love to get a digital copy of the below brochure if anyone has one. Some folks attached these flags to their rigs. 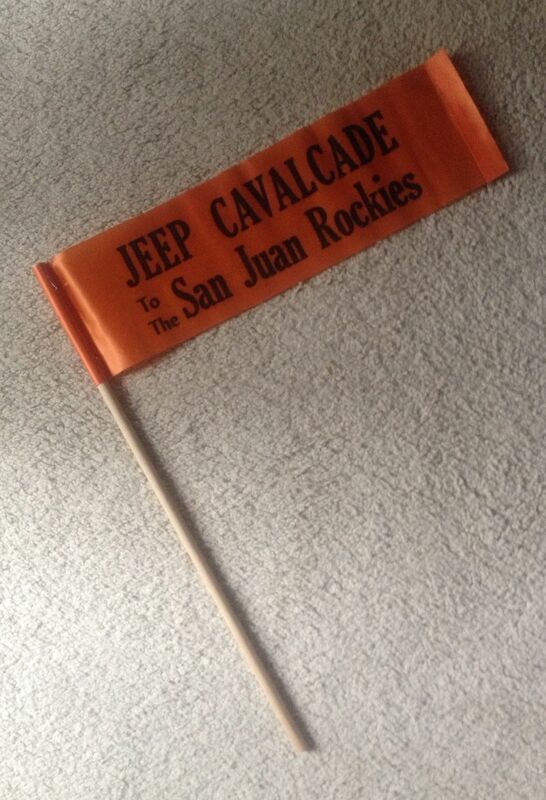 I hope to gather more information about the Jeep Cavalcade soon. 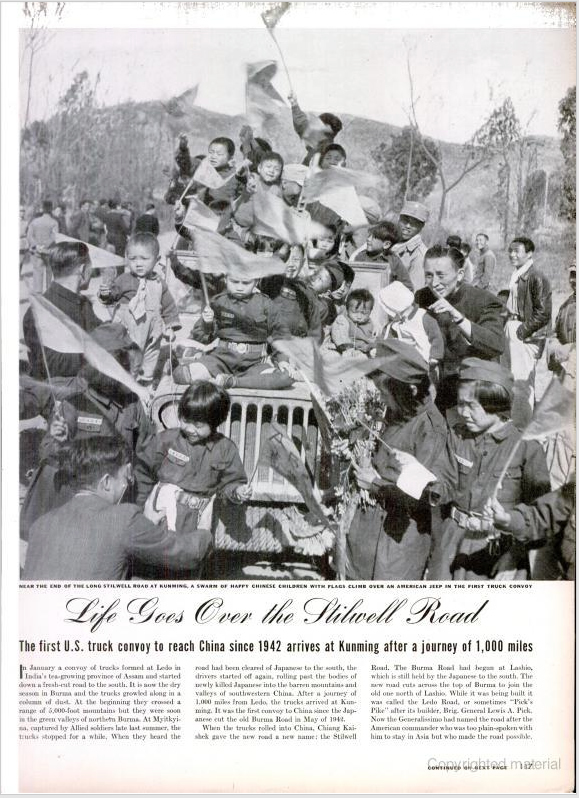 In the meantime, I’ve only been able to document that one of these photos appeared in print in the December 28, 1959, issue of Life Magazine (the one below). 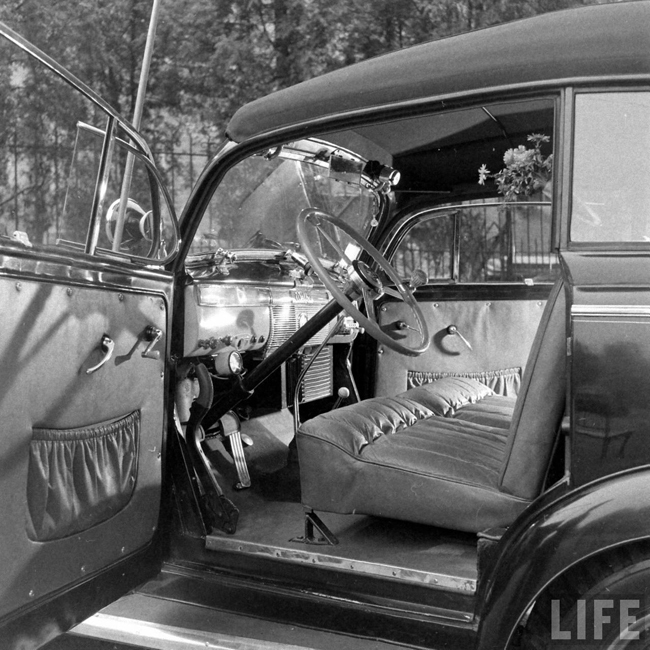 November 28, 2017 • CATEGORIES: Features, Magazine, Old Images, Trips, Women & Jeeps • TAGS: Life-Magazine. UPDATE: This was published back in 2010. This seems appropriate, since the post below this one may feature the dozer blade shown in the photos below. In 1948 (Harry) Buschert joined the first Hemet Jeep Cavalcade and jumped in a jeep with Harvey Gibel at the Hemet Farmer’s Fairgrounds. 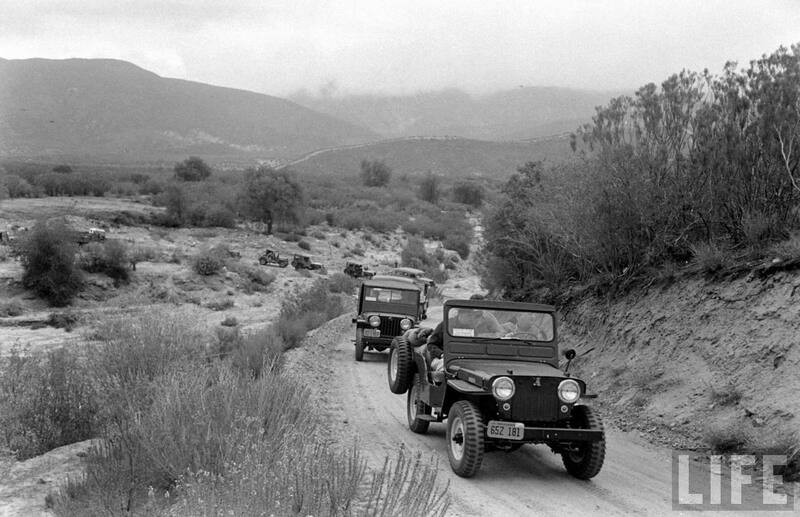 The first Cavalcade, sponsored by the Anza- Borrego Trails Association and the Hemet Valley Chamber of Commerce, began as a way to show the public the need to pave the road between Hemet and Borero Springs. 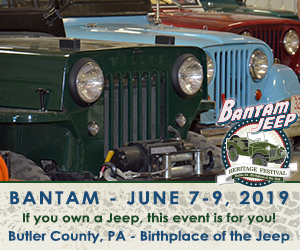 Over 400 Jeeps and 800 passengers came out for the first event. 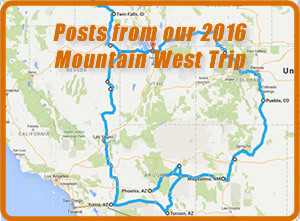 They took two days to travel down Coyote Canyon. Buschert would participate and assist in running the events for years to come. 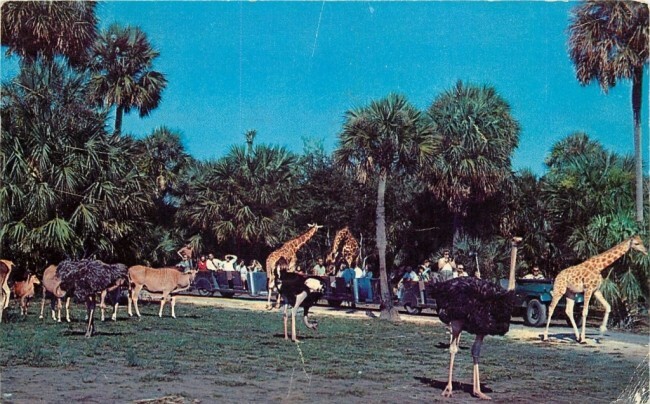 The event ran continuously until 1973. 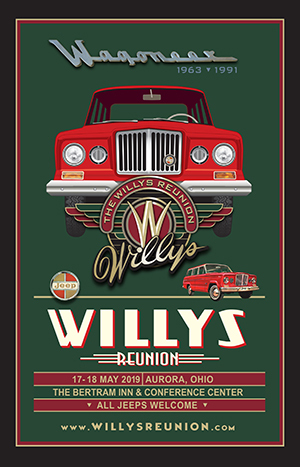 By 1973 the movement pave the road had become obsolete, the high prices of gasoline made the event too costly, and the perceived impact of the event affecting public perception all led to the its ending. 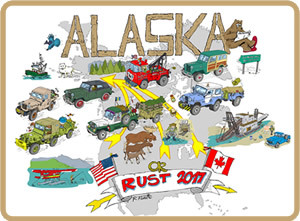 The event took a fifteen year hiatus and began again in 1988, Buschert took part in the anniversary run. 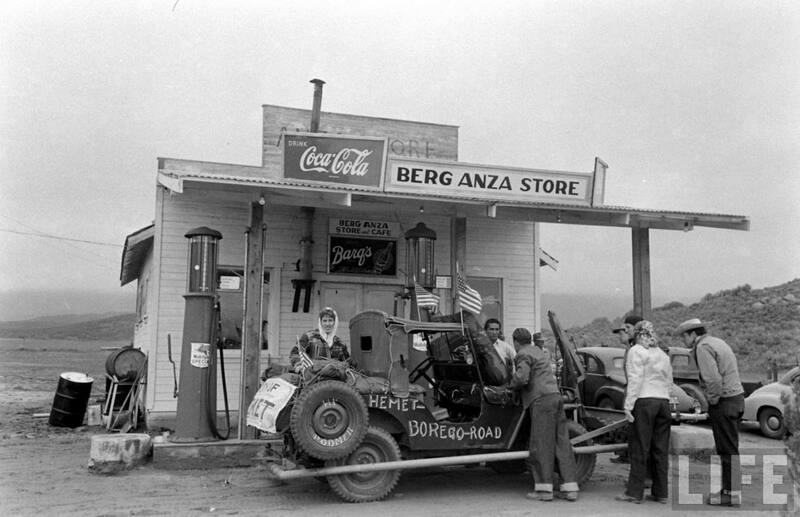 The Life Magazine Photographer was Peter Stackpole, whom the New York Times described as a chronicler of California Trends. Peter was part of the first group of photographers hired by Life Magazine. You can view all the photographs of this two day ‘Jeep Ride’ in 1949 here. I have included small versions of a few of my favorite images. 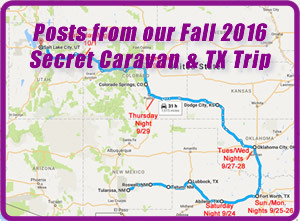 Click on the images to see blown up views. 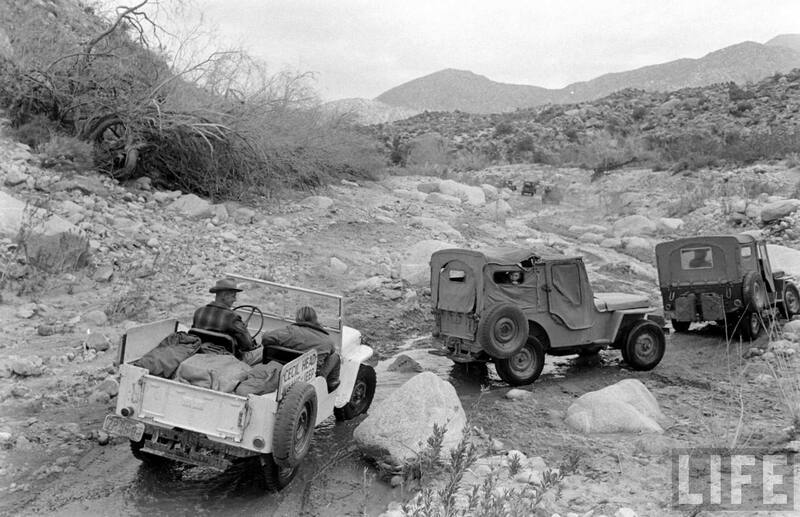 And finally, when’s the last time you saw a Ford GP out Jeeping? 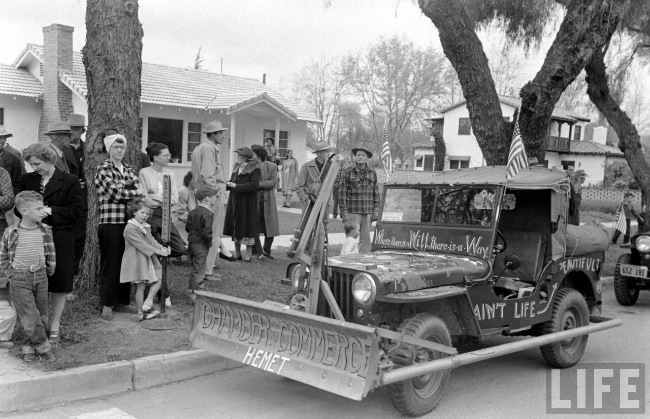 Again, you can see MANY more pics of this 1949 Hemet Jeep Club Calvacade at the Life Magazine Image Archives. April 22, 2015 • CATEGORIES: Features, Magazine • TAGS: Life-Magazine, Uranium. 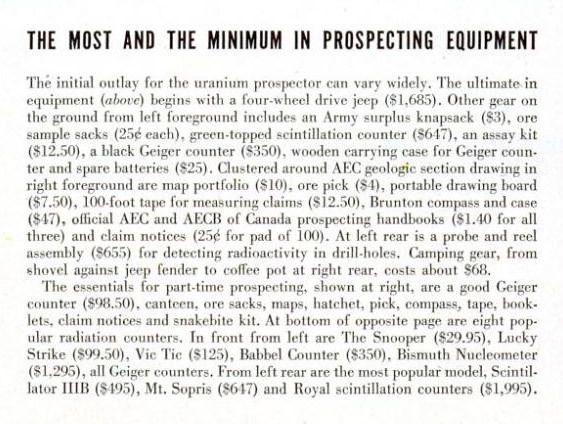 So large was the hunt for Uranium, the May 23, 1955, issue of Life Magazine noted that more man-hours had been spent hunting for Uranium between 1952 and 1955 than were spent seeking all other metals in history, at least according to the Atomic Energy Commission. Having spent considerable time thumbing through decades of mine related information prior to the 1900s, I find this claim dubious, but maybe someone can explain how this could be? November 2, 2014 • CATEGORIES: Magazine, Old Images • TAGS: Life-Magazine. 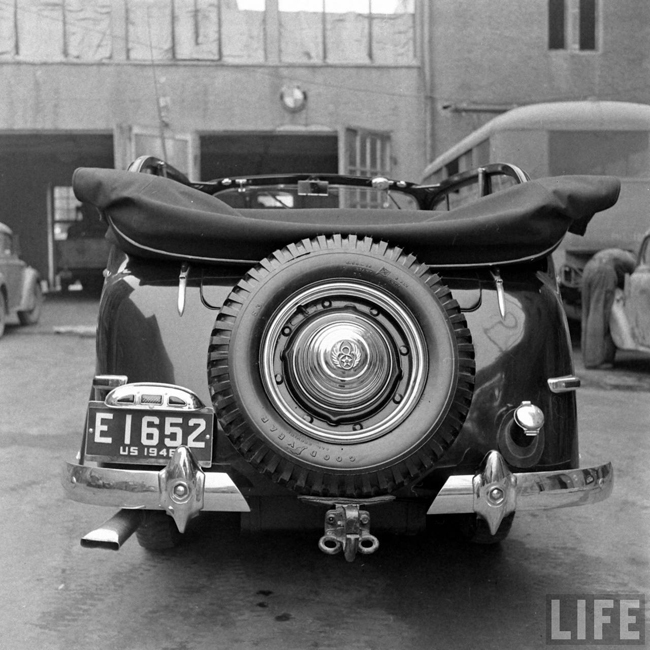 Taken by Life Magazine photographer Frank Scherschel, I found this photo at the picturesdotblog site. Note the use of the parking brake! 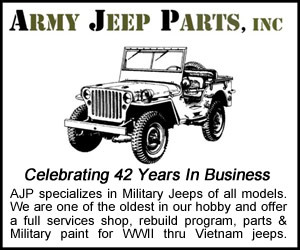 Also note the “press” sign on the front of the jeep. 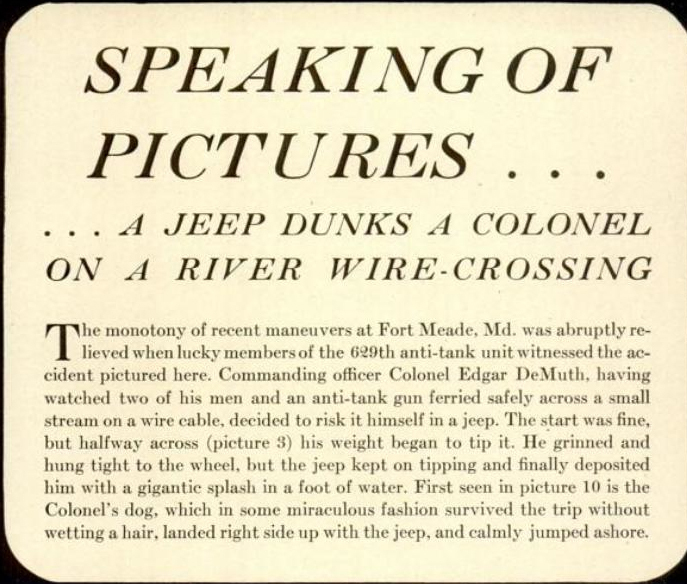 Do you suppose the wire cutter on the front of the press jeep was cut so that it wouldn’t interfere with photos? Jeeps (including a press vehicle) in the town square, Marigny (Manche), Normandy, 1944. October 27, 2014 • CATEGORIES: Features, Magazine, Old Images • TAGS: Life-Magazine. 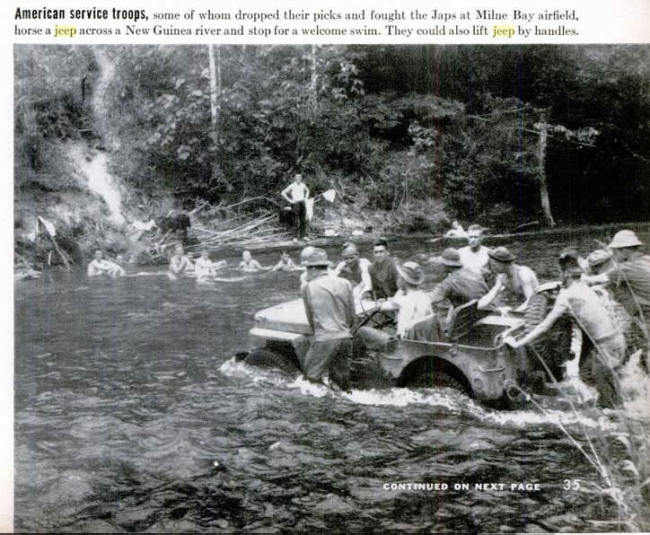 The November 30th, 1942, issue of Life Magazine featured this photo of soldiers pushing a jeep across a river in New Guinea. March 1, 2014 • CATEGORIES: Features, Magazine, Old Images • TAGS: Life-Magazine. This photo was published by Life Magazine. I’m still hunting down the issue. 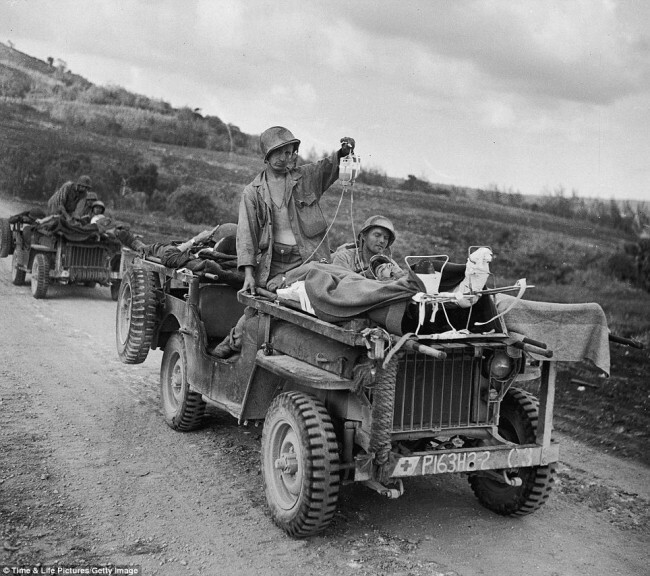 February 28, 2014 • CATEGORIES: Artists/Drawings, Bantam-FordGP-WillysMA-EarlyJPs, Features, Women & Jeeps • TAGS: Life-Magazine. 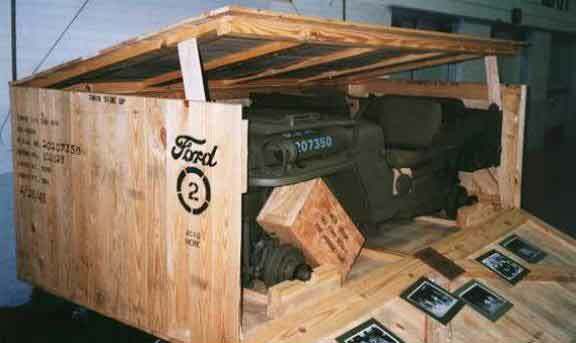 Here’s a set of Ford GPs in Burma during WWII. 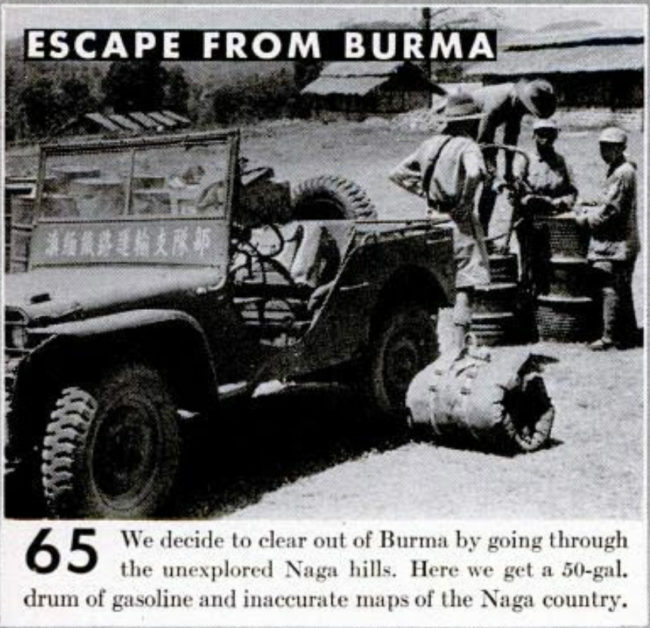 The photo is from the June 08, 1942, issue of Life Magazine. 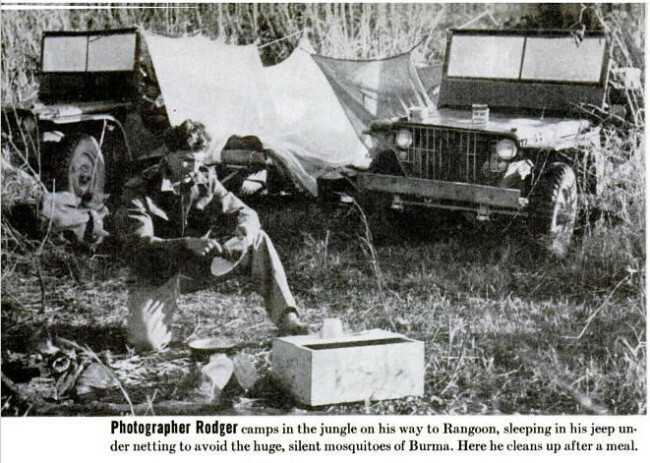 The article, “Flight from Burma” on page 30, is a fascinating tale of the desertion of the Rangoon, as told by George Rodger, the photographer pictured in the photo with the two Ford GPs below. February 18, 2014 • CATEGORIES: Artists/Drawings, Features, Magazine, Old Images • TAGS: Life-Magazine. 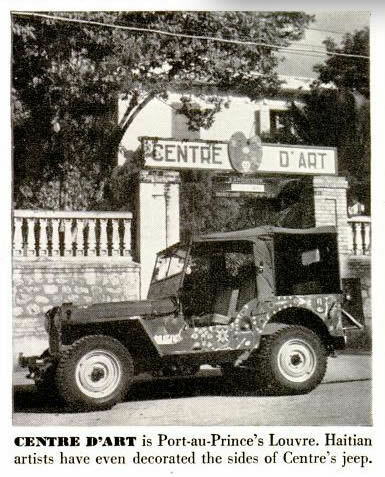 1950 photo of the Centre D’Art CJ-2A. 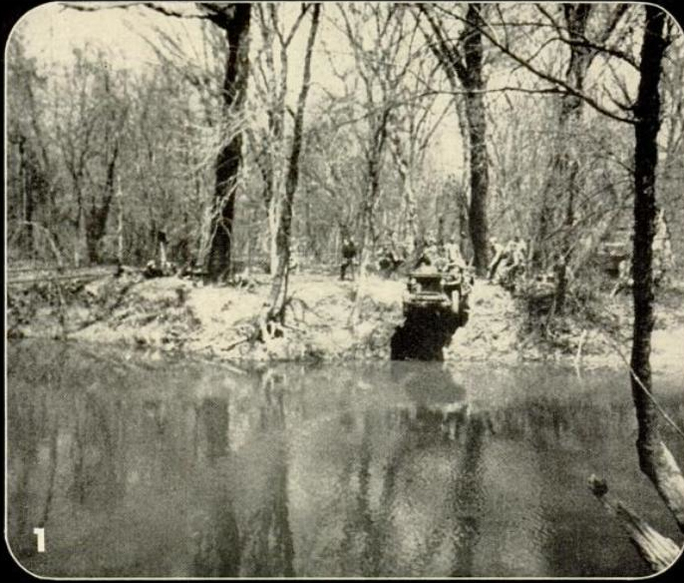 This is a snapshot from the US Information Service video shown below. 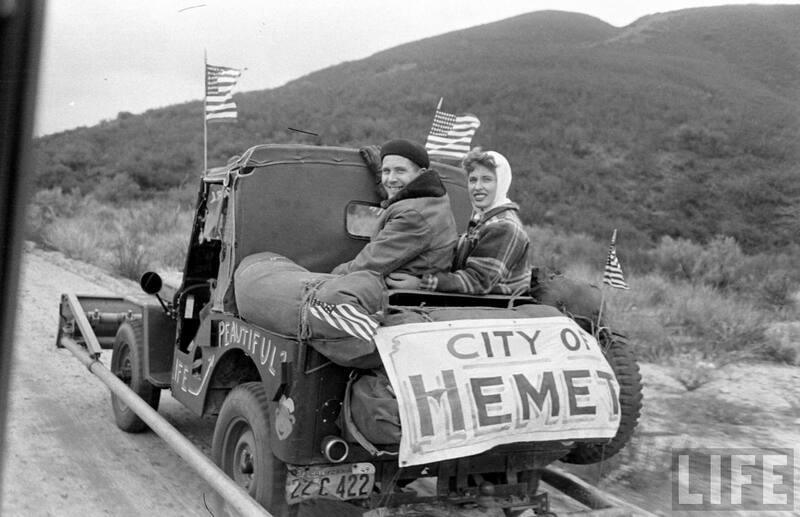 In 1943, WWII conscientious objector and artist American DeWitt Peters chose to go to Haiti to teach English. After a year, he wrote to the Haiti’s Ministry of Education and suggested he could do more for Haiti by establishing a school of painting. 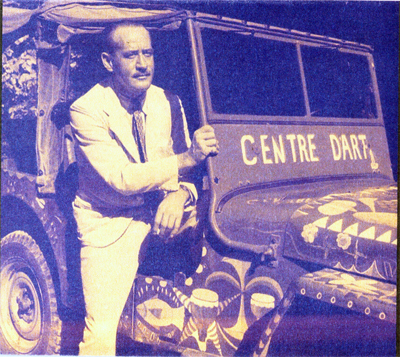 Using some of his own money, along with US State Department and Haitian funds, he helped launch the LE CENTRE D’ART. The goal of the center was to encourage the development of Haiti artists and folk art. 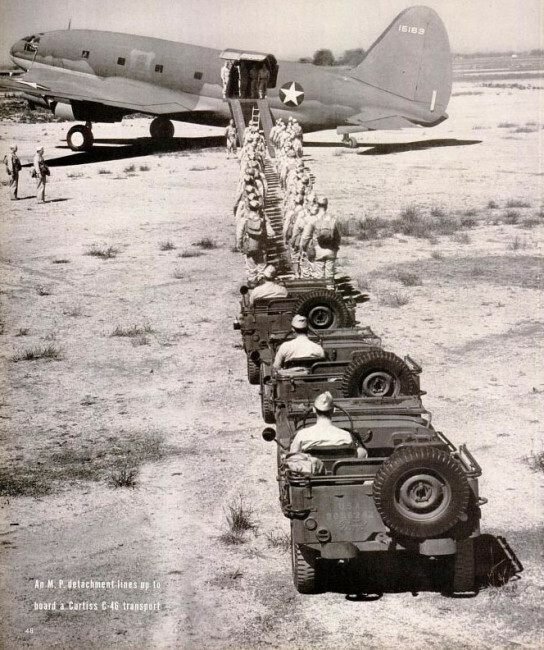 Image is from Life Magazine circa 1947. This looks different from the other photos. 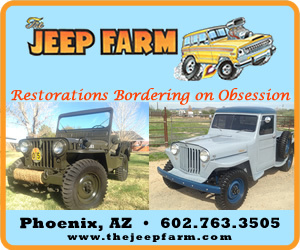 It is possible the jeep was repainted regularly. 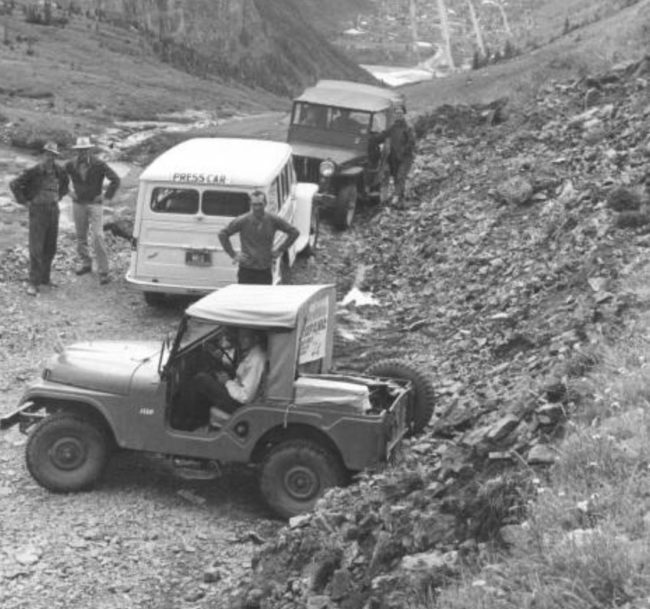 To help advertise the Center’s work, Dewitt Peters used his jeep as a rolling mural. 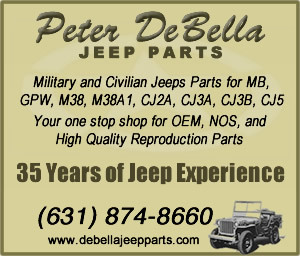 As you can imagine, this color jeep must have been quite a sight motoring around Port-au-Prince. Dewitt also used the jeep to deliver art supplies to rural painters. 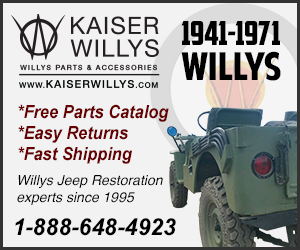 The video below from the United States Information Service shows his jeep from timestamps 5:17 to about 8:00. 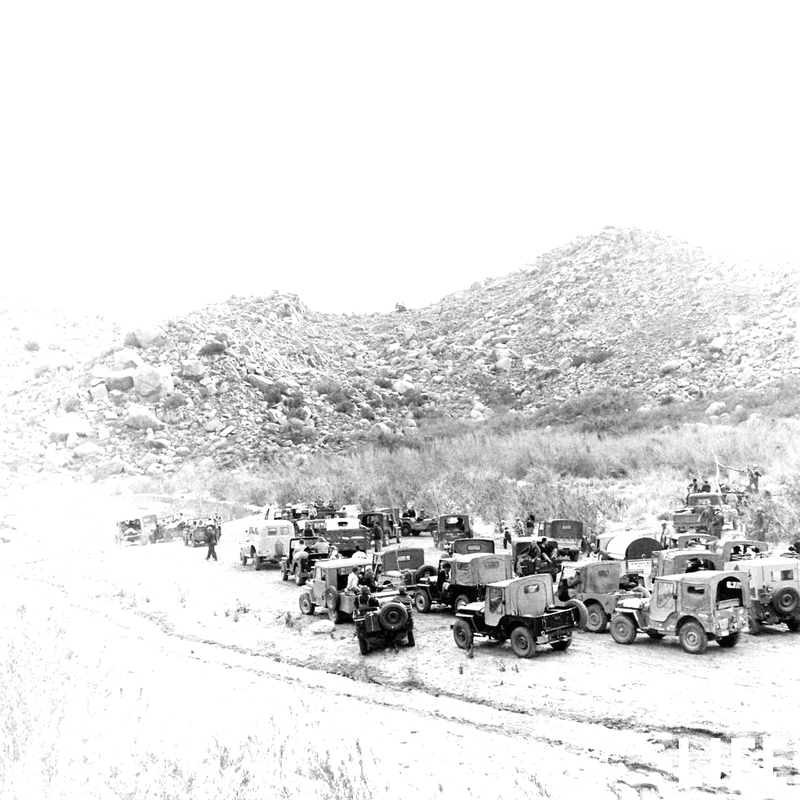 Too bad it isn’t in color. Many publications credit DeWitt for launching a renaissance in Haitian folk art, however some historians question his overall impact. 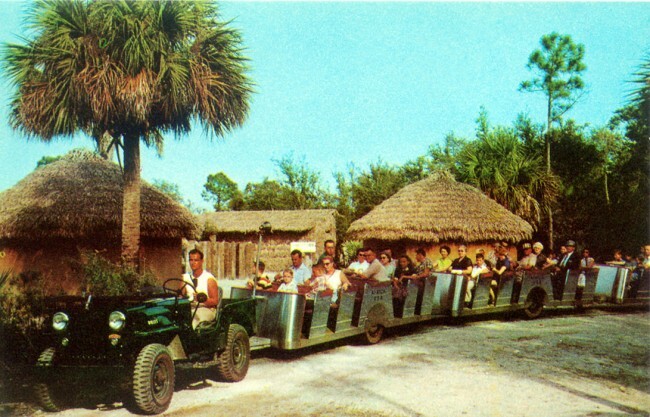 However, one thing he might have launched is the Tap Tap Buses and Taxis, whose outsides are highly colorful and continue to shuffle riders to this day. 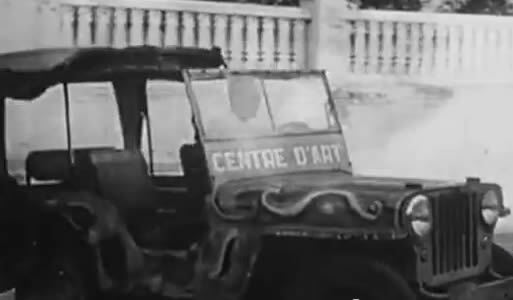 Unfortunately, the Centre’ d’Art’s building was completely demolished in the Haitiian Earthquake. Life Magazine, August 1, 1947, article titled “Haitian Painting”, pgs 58-61. February 2, 2014 • CATEGORIES: Features, Magazine • TAGS: Life-Magazine. 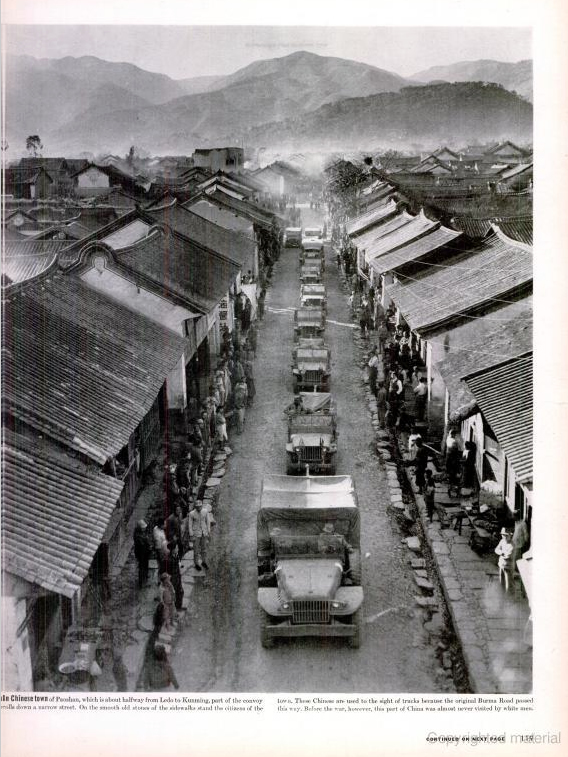 Life Magazine captured the scene when a convoy of jeeps and trucks navigated over the Burma road and reached Kunming, China, for the first time. The article is called “Life Goes Over the Stilwell Road” and was published in the March 12, 1945, issue on page 117. December 3, 2013 • CATEGORIES: Features, Old Images • TAGS: Life-Magazine. 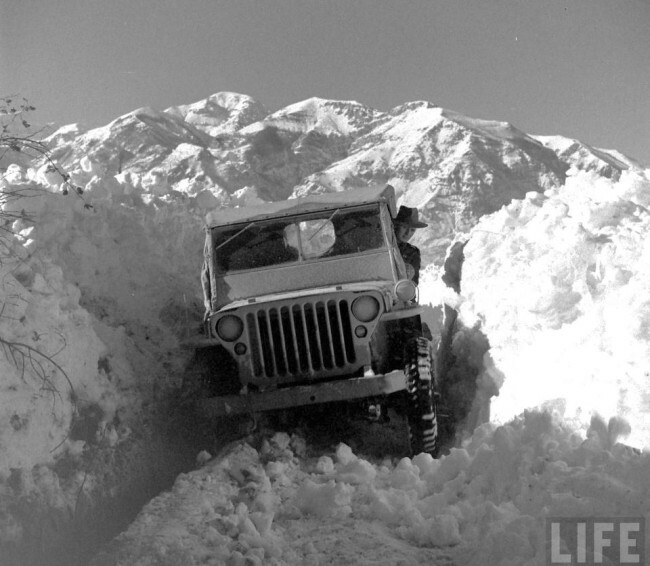 Not a great day for driving a jeep. 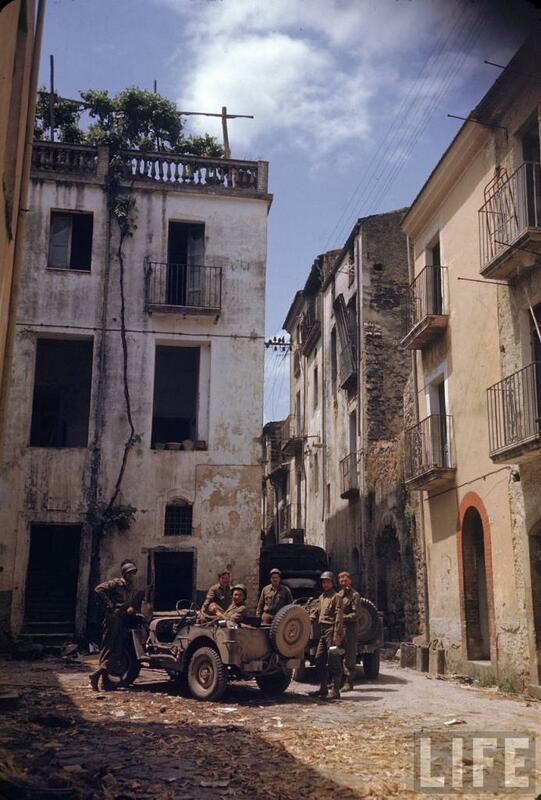 This 1950 photo of Nightmare Alley was shot as these troops retreated. 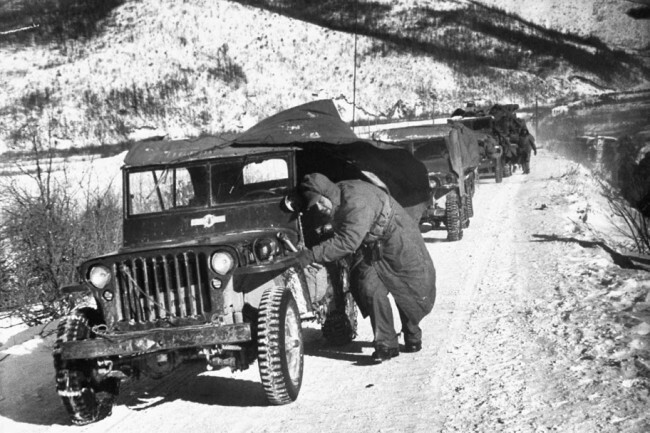 The temperature was estimated at -40 degrees. Read more about this LIfe Magazine photo here. David Douglas Duncan / TIME & LIFE Pictures. 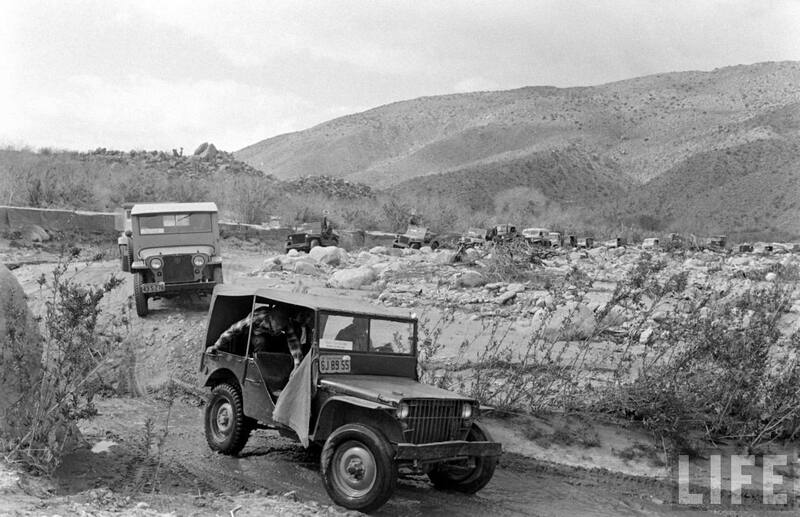 U.S. Marine crouching down next to his jeep while leading a convoy of vehicles during the 1st Marine Division’s retreat down canyon road they called “Nightmare Alley,” after being cut off by the Red Chinese and under fire from nearby hills in December 1950. 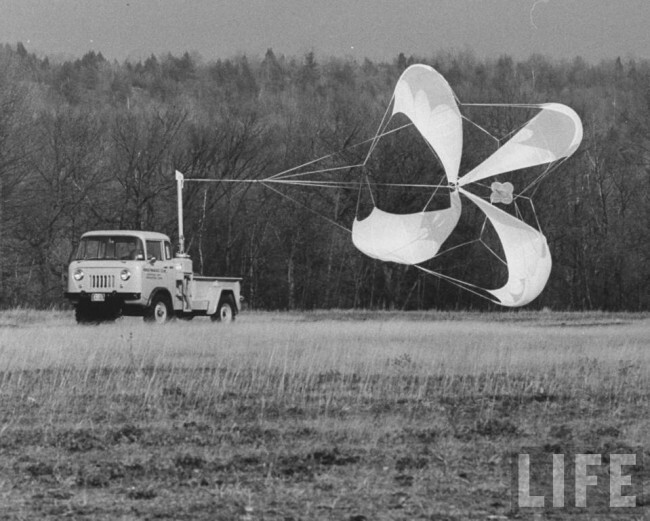 November 23, 2013 • CATEGORIES: Features, Old Images • TAGS: Life-Magazine. Life magazine photographer W. Eugene Smith too this photo on Mariana Island of Saipan during the summer of 1944. You can see more photos at dailymail.co.uk’s site. 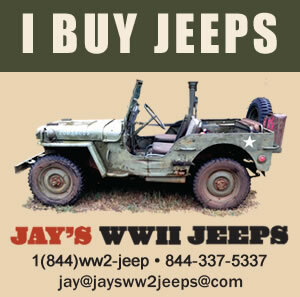 As you can see, both of these jeeps are MB Slatgrilles. Interesting that the spares are stored in the same place used later by the CJs. November 9, 2013 • CATEGORIES: Features, Magazine, Old Images • TAGS: Life-Magazine. The August 03, 1942, issue of Life Magazine has an article about Transport Planes. The article includes photos of some GPWs. I’m pretty sure I wouldn’t want to be wedged in there next to the jeep during a bumpy flight! 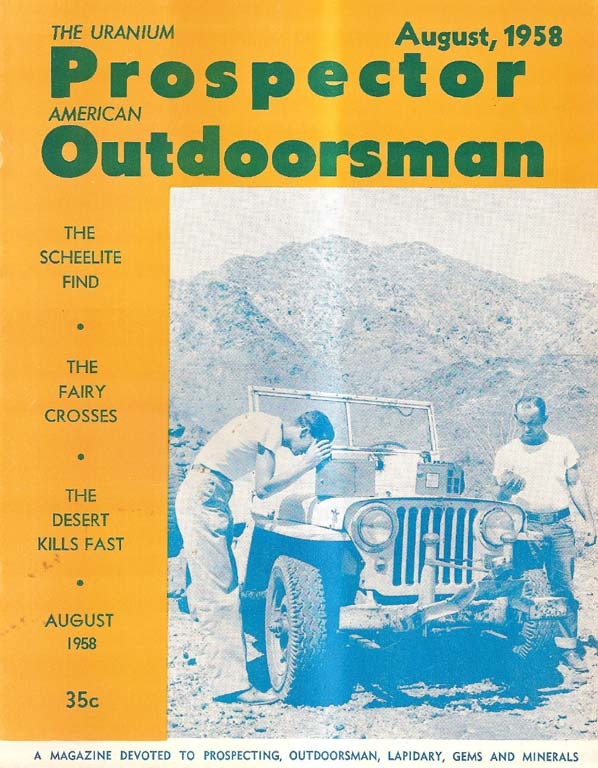 There is a copy of this issue on eBay as well. November 1, 2013 • CATEGORIES: Bantam-FordGP-WillysMA-EarlyJPs, Features, Magazine • TAGS: Life-Magazine. John spotted this photo on this website from page 29 of the March 30, 1942, issue of Life Magazine. 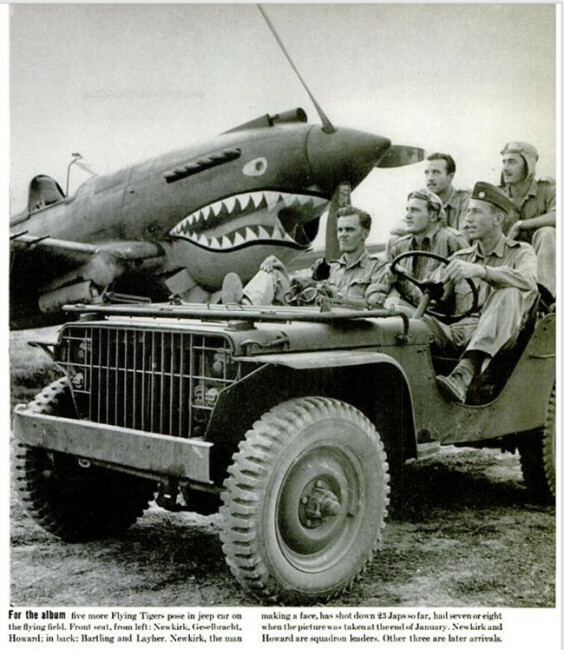 The article covered the Flying Tigers and features some great photos. October 25, 2013 • CATEGORIES: Features • TAGS: Life-Magazine. 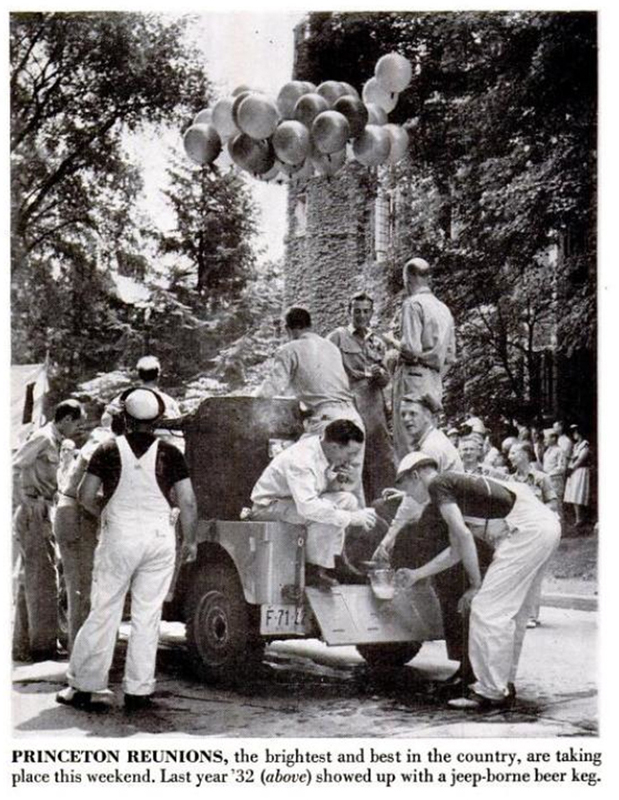 The Princeton graduating class of 1932 used a jeep to celebrate their 15th reunion (in 1947) by hauling a keg in it. 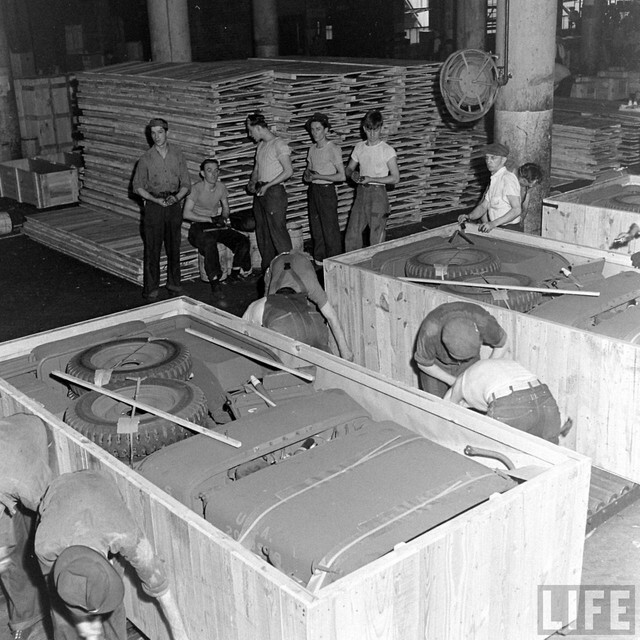 This photo was published in the June 16, 1947, issue of Life Magazine (page 60). 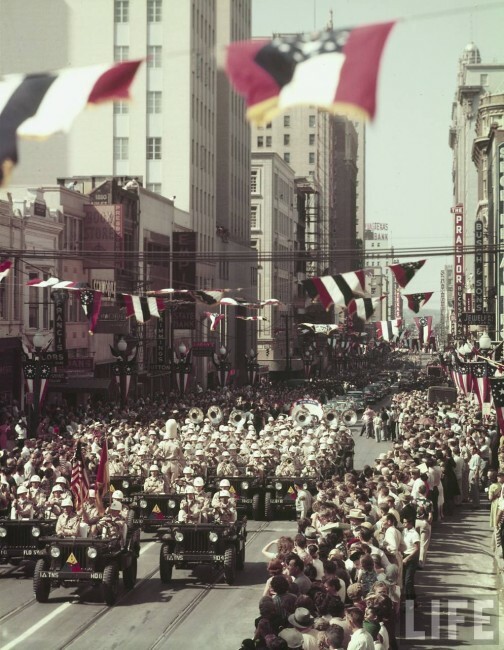 The related article takes an in-depth look at the class of ’32 by interviewing and publishing their incomes, job changes, marital status and more. It’s actually a pretty interesting article. I was surprised to see that by 1947 31% of marriages ended in divorce. One of the graduates of ’32 was Jimmy Stewart. Do you suppose he’s somewhere in the back of that jeep? September 12, 2013 • CATEGORIES: Features, Magazine • TAGS: Life-Magazine. 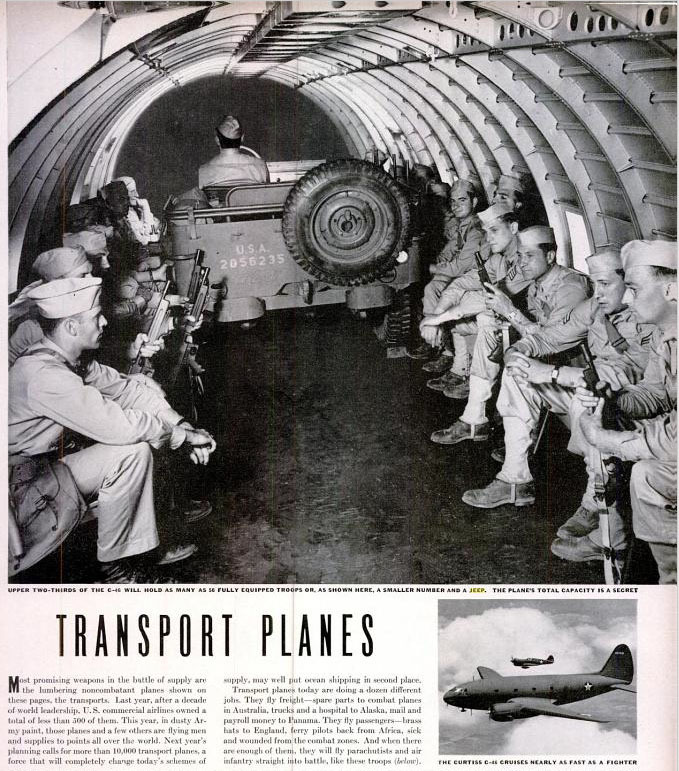 I bought a cheap copy of the May 5, 1942, issue of Life Magazine off ebay the other day. In it I found these photos on page 8-11. 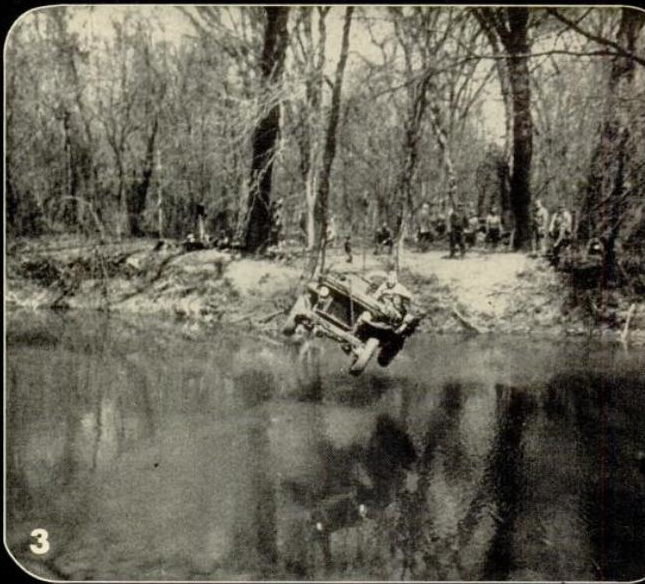 It was a failed effort to slide a jeep across a river by cable. 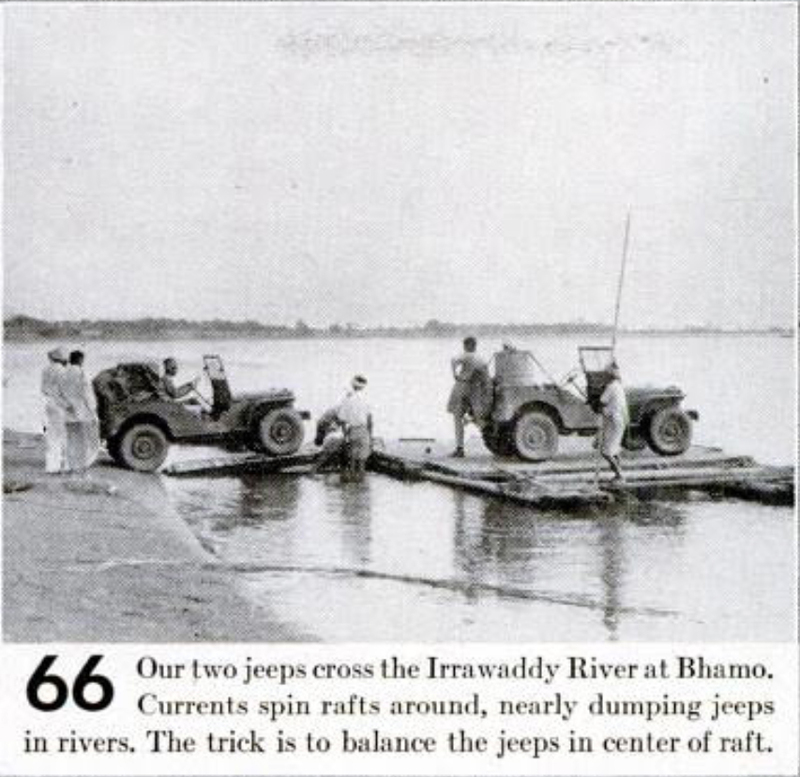 Before I show a the hanging jeep, I wanted to share the photo below that shows some jeeps aboard a vessel of some sort. 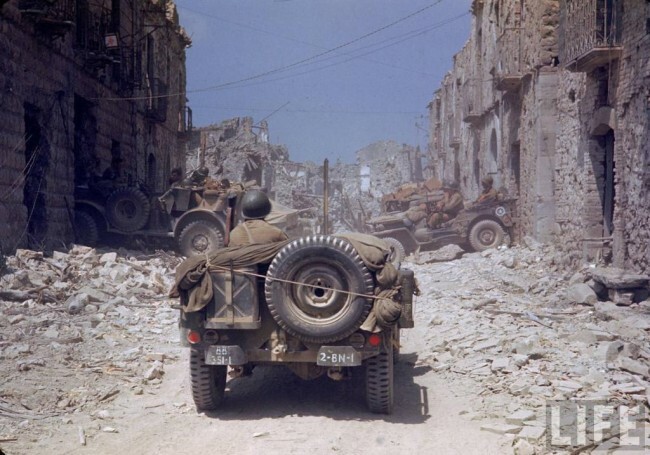 Here’s the jeep by cable from pages 8-11. You can view the magazine on Google. July 18, 2013 • CATEGORIES: Features, Old Images • TAGS: Life-Magazine. 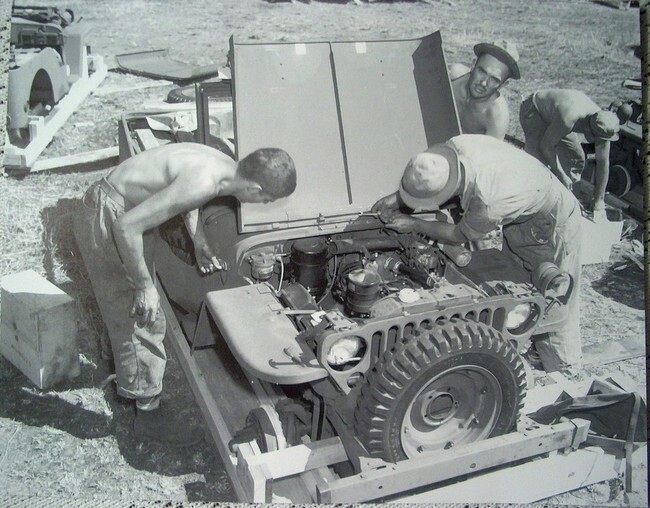 Hugh forwarded these crated jeep photos. June 26, 2013 • CATEGORIES: Features, Magazine, Old Images • TAGS: Life-Magazine. 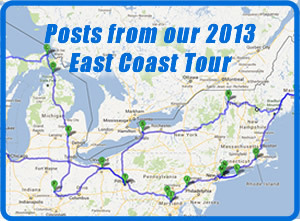 John forwarded these two great photos. I couldn’t find these published in any specific issue of the magazine. 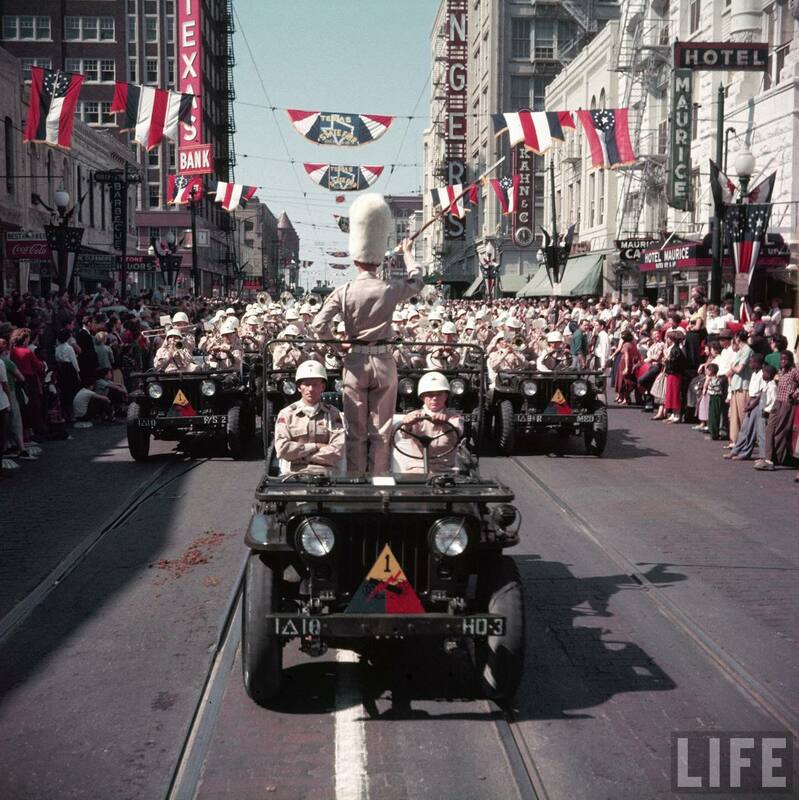 1953 Parade in Which Texas Town? May 21, 2013 • CATEGORIES: News • TAGS: Life-Magazine. 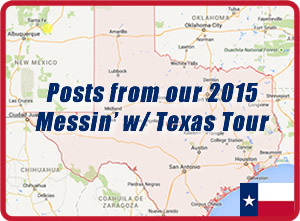 Question: What happens when you combine the festive atmosphere of the Texas State Fair, a U.S. Army Band and a battalion of M38 Army Jeeps. 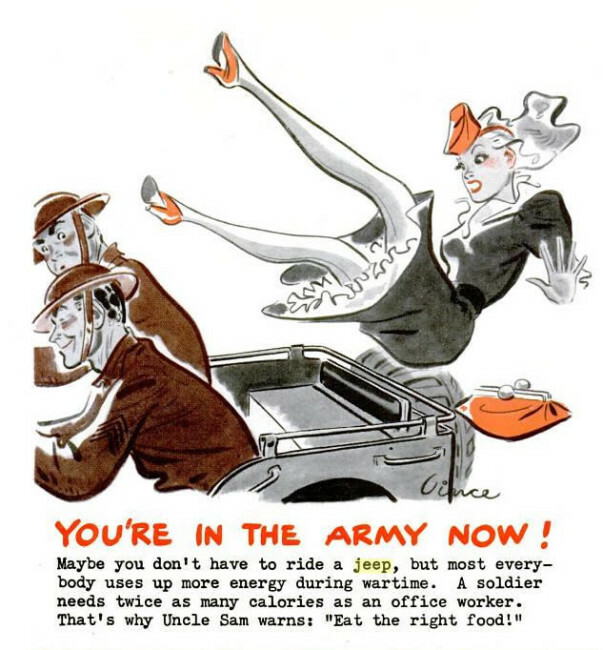 Answer: You have a huge parade and tax the driving skills of 24 soldiers with driving in close-order formation. 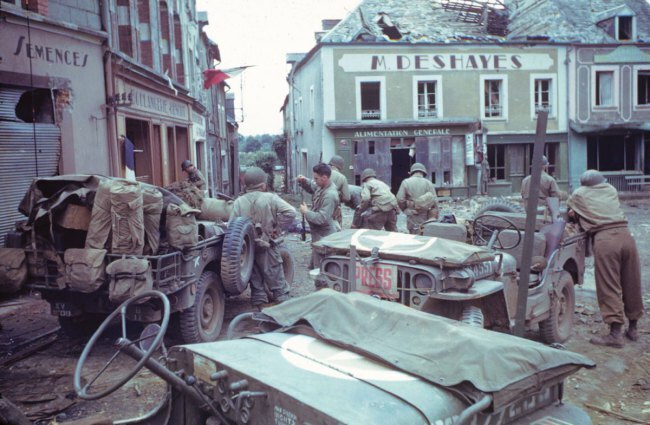 These LIFE photos by John Dominis are available for sale on the internet. 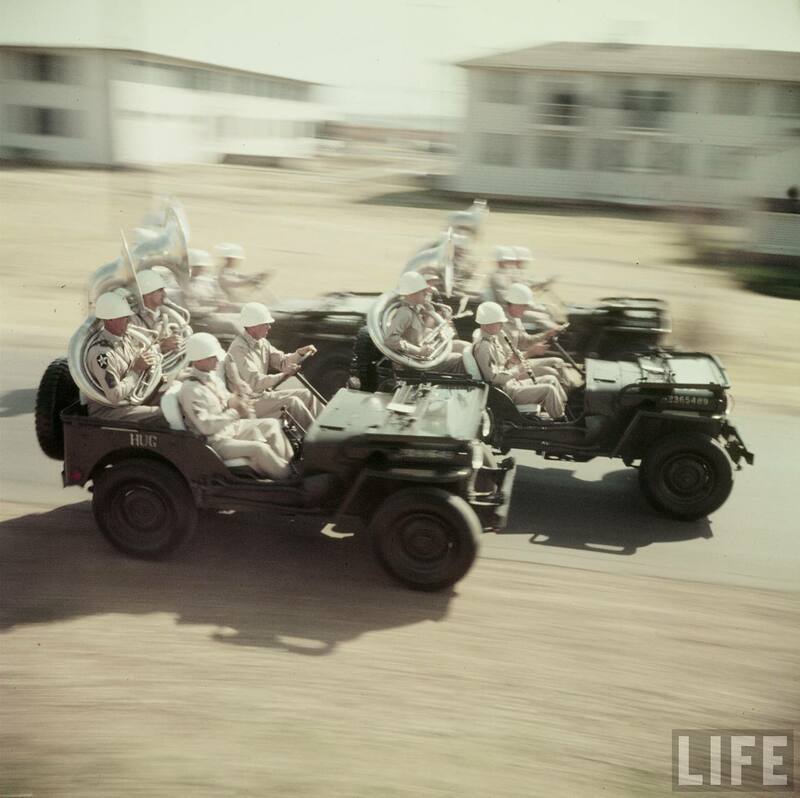 Do an Image Search on “LIFE Jeep-Borne Army Band”. 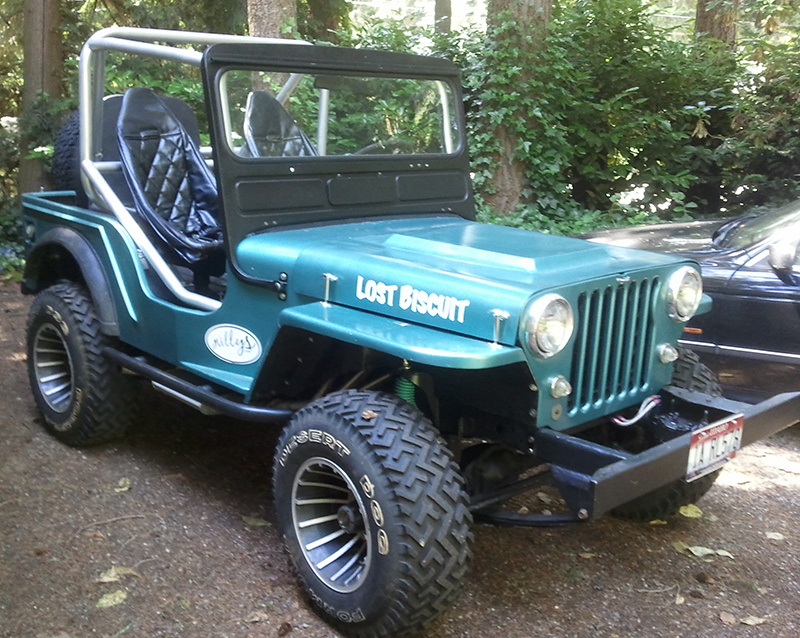 I count 24 jeeps………. Can anyone identify the name of the city in Texas where this was photographed? 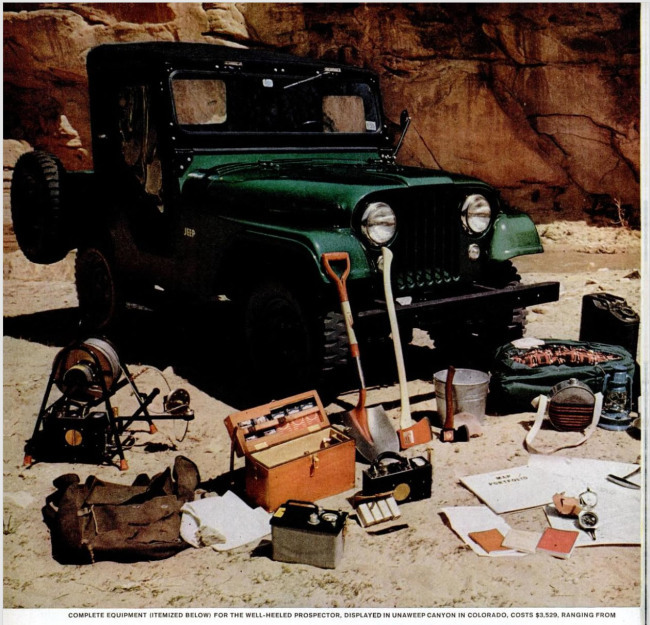 February 21, 2013 • CATEGORIES: CJ-2A, Magazine, Old Images, Women & Jeeps • TAGS: Life-Magazine. 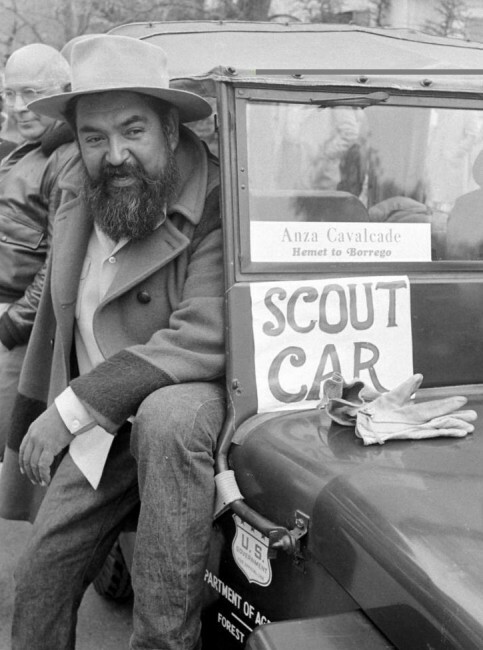 Robert spotted this great link of Life Magazine Photos. The photos range across the decades, including black/white and color ones. 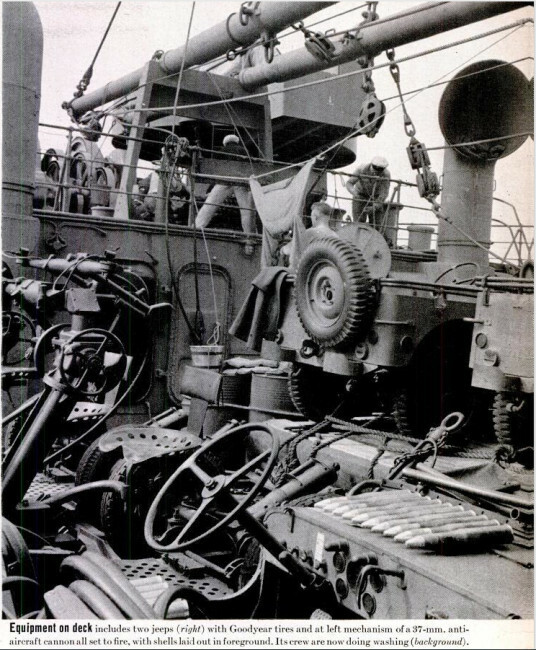 This was photographed by Myron Davis for the July 1945 issue. 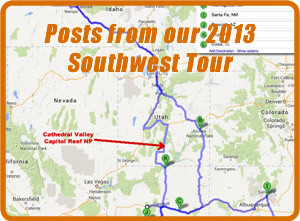 February 12, 2013 • CATEGORIES: Features, Magazine • TAGS: Life-Magazine, Yakima Ridge Runners. 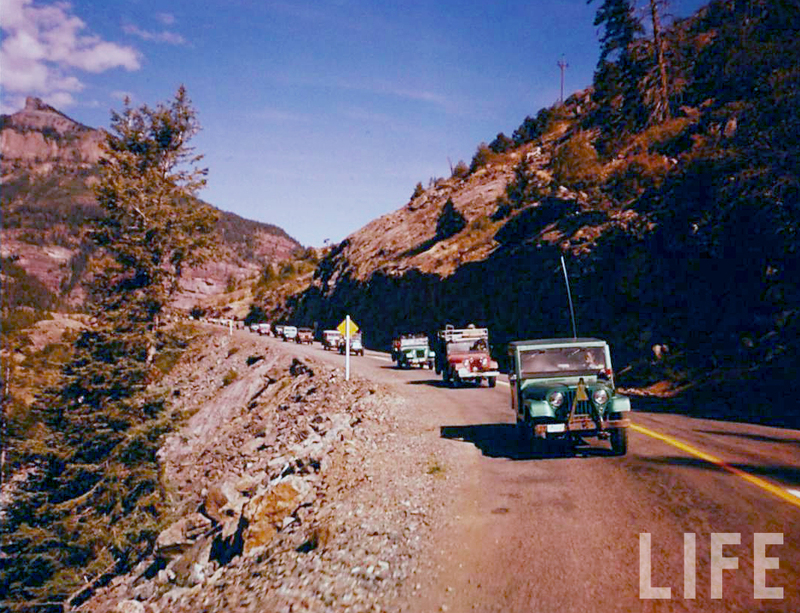 This May 14, 1951, issue of LIfe Magazine contains the article about the Yakima Ridge Runners. You can preview it on Google. 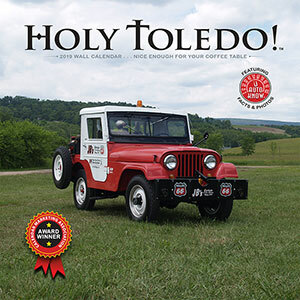 December 12, 2012 • CATEGORIES: Advertising & Brochures, Features, Magazine, Postcards, Women & Jeeps • TAGS: Jeep-Trains, Life-Magazine. 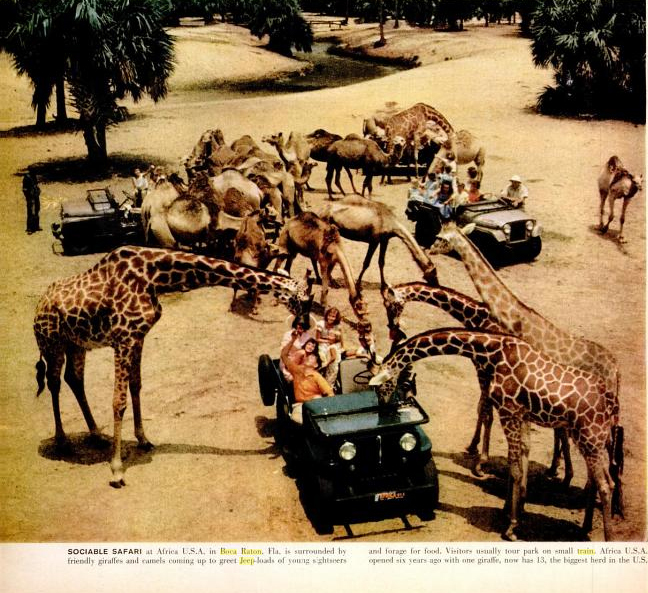 Africa USA, was part of a theme-park movement in the late 1950s that included New York’s Freedomland, Disneyland, Wisconsin’s Fort Dells, and others. 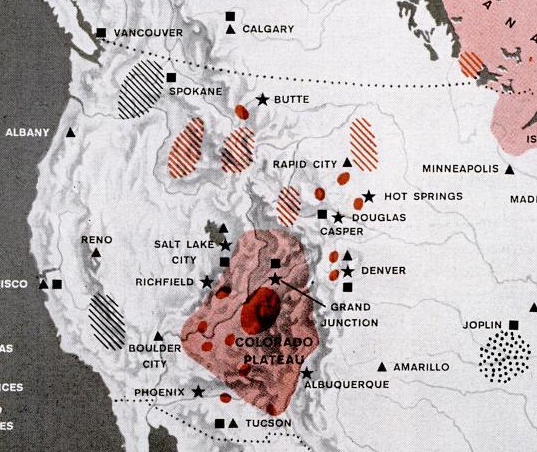 By 1959 these parks were collectively making $2 billion. 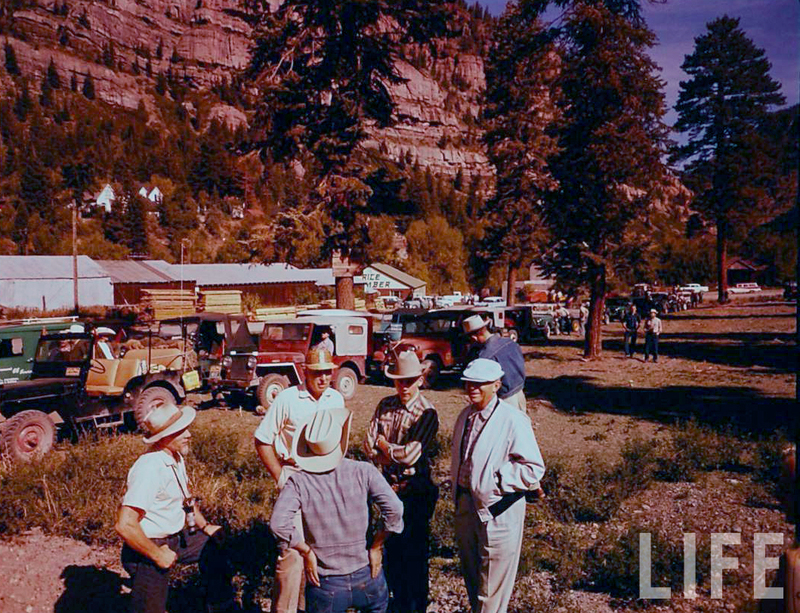 There is a feature article about these parks in the August 1, 1960, issue of Life Magazine. 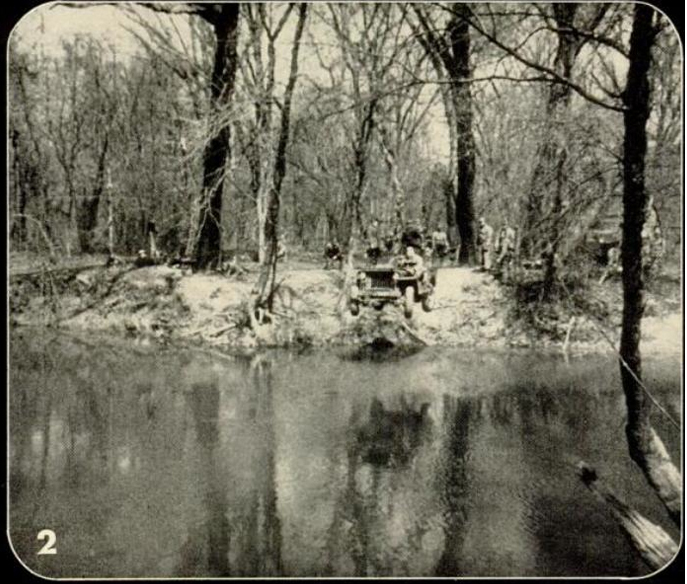 The picture below is from that article. 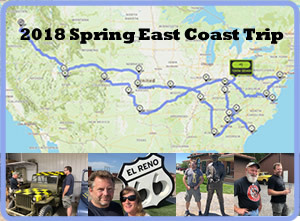 You can take a ‘virtual’ jeep-train tour here (don’t expect much). 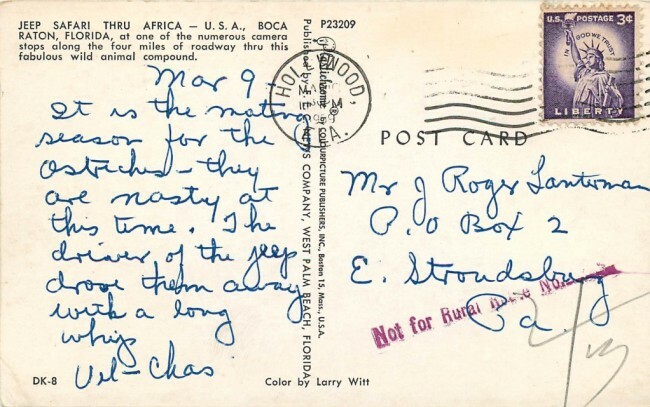 This postcard image is from a jeep train that operated at Africa, USA. It was posted on Flickr here. This 1959 postcard shows the tourist attraction upgraded to CJ-5s at some point. 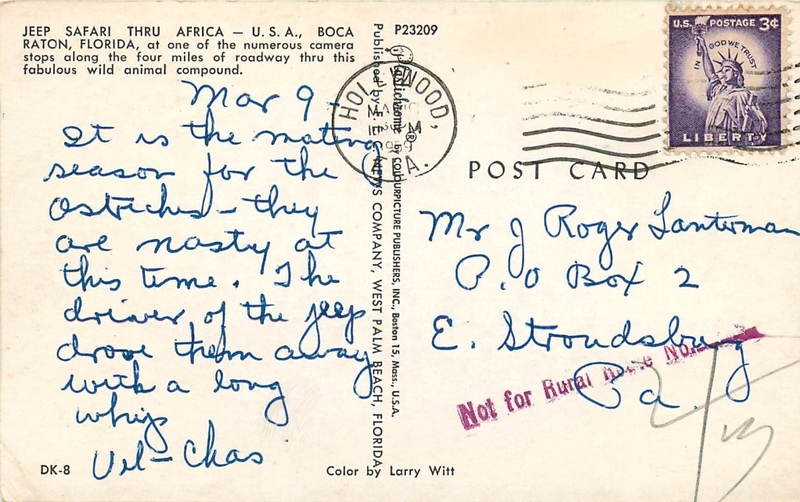 This postcard is also available on eBay. 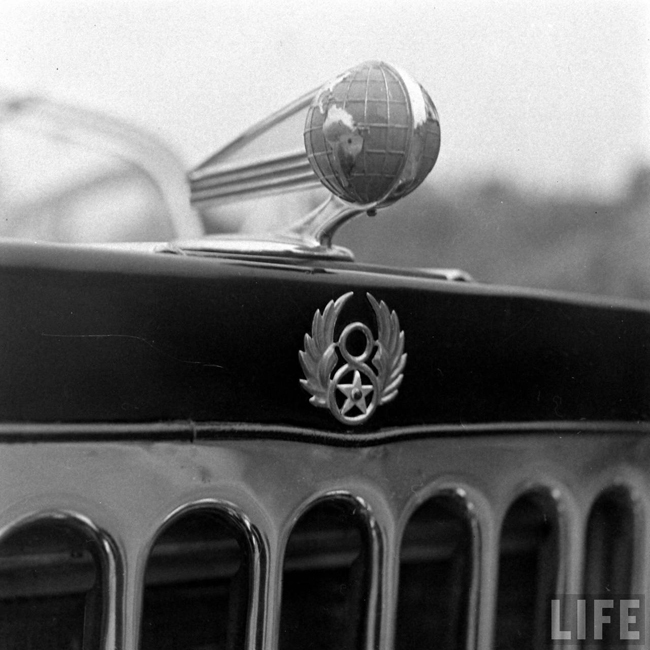 October 22, 2012 • CATEGORIES: FC150-FC170-M677, Features, Old Images • TAGS: Life-Magazine.